The State of California requires biological or adoptive parents provide financial support for their children. This support is for the benefit of the child, and helps to alleviate expenses associated with child rearing. The California Department of Child Support Services oversees administration of child support for the state. 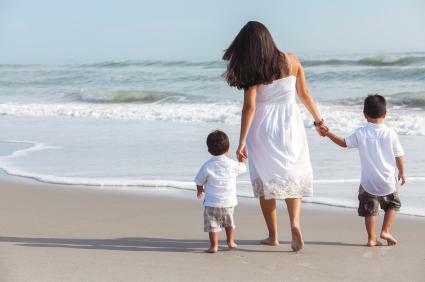 The California Child Support Handbook give details on California State laws regarding child support. These laws discuss how support is calculated, who receives and pays support, as well as laws about support modification and review. Contact your Local Child Support Agency (LCSA) office. Download an application for services. You must mail or drop off the application at the LCSA. Within 20 days, the LCSA will open a case. The LCSA will contact both parents for interviews. The LCSA will complete and file the necessary paperwork with Family Court and serve the other party. The office will also calculate support based on standard calculations and the financial data you supply. If both parents agree, then the LCSA will submit the order to the court and, upon receiving an Order of Child Support, begin collecting from the payer. If parties do not agree, they will need to go to court and have their case heard before a Family Court judge or commissioner, who will determine child support and issue an order. There is a $25 annual fee for LCSA services, unless the custodial parent receives Temporary Assistance for Needy Families (TANF). Alternatively, parents may hire an attorney to initiate the process and file the necessary paperwork. To modify an existing child support order, contact an attorney or your LCSA. The LCSA also provides collection, distribution, and enforcement services. The agency can help you locate a missing parent, establish paternity, or garnish wages to ensure child support is paid. Custodial parties can have payments made either via Direct Deposit or via a debit card. You can enroll for either payment option on the State Disbursement Unit (SDU) website. Non-custodial parents can also streamline their payments on the SDU website, setting up recurring bank account withdrawals, as well as debit or credit card payments. Child support exists so children can continue their quality of life regardless of their parents' relationship. If you are entitled to child support, it is in your children's best interests to begin the child support process in order to fully support your children. If you are obligated to pay support, you are helping your children by providing for them financially, just as you would if you were still with their other parent.